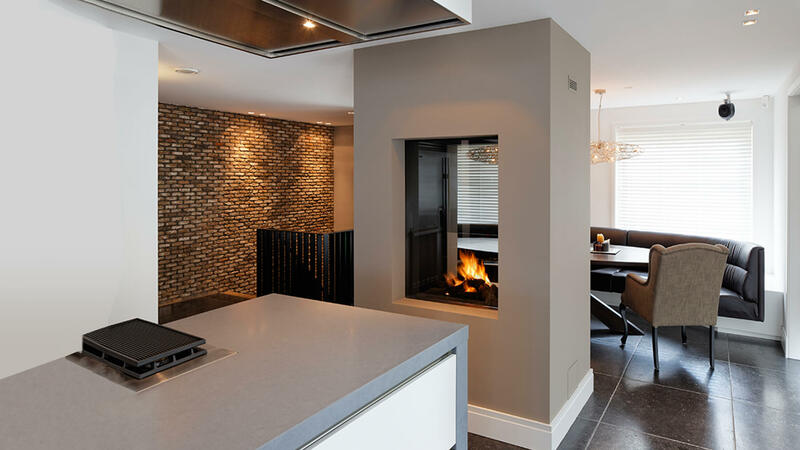 A modern and stylish two sided fireplace that offers both fantastic aesthetics and great functionality. Ideal as a way of creating a separation between two spaces or even being installed between two rooms, this design like other two sided fireplaces in the collection, can be used to hide structural columns and create a unique focal feature. The expansive glass means you get a great view of the flames and light flow is maintained between the spaces. Perfect for installing between a kitchen and a dining room, it creates a cosy feature for both spaces. To see how a two sided fireplace like this can be incorporated please contact a Design Consultant.